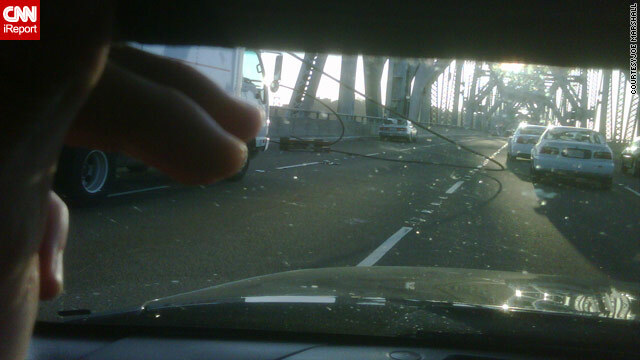 Joe Marshall, an iReporter, was 50 yards behind where the cable fell on the San Francisco-Oakland Bay Bridge. (CNN) -- Officials warned Wednesday that the bridge linking the California cities of San Francisco and Oakland will likely remain closed Thursday morning, promising more delays for Bay Area commuters. That work is intended to dampen vibration on the structure. Vibration may have played a role in causing pieces of the San Francisco-Oakland Bay Bridge to fall Tuesday night from the span onto the roadway, resulting in its closure. The 73-year-old bridge spans the San Francisco Bay and carries an average 280,000 vehicles daily, according to the state's Transportation Department. "Right now, we do not have a time when the bridge will potentially open," said Bart Ney, a spokesman for California Department of Transportation. "The work has to be completed first." Once the new steel is in place and the rods have been made tense, at least three hours of testing will be carried out before the bridge will reopen to vehicular traffic, Ney said, refusing to speculate on when that might occur. "The first thing that I would say to motorists is that you need to be at this point planning other routes over the next day or so," he said. The Federal Highway Administration and the Seismic Peer Review Board are scrutinizing the repair plans, he said. Wednesday's commute was a horror show for many. "My wife actually drives over to the peninsula; she says it's taken her two hours to get to work so far and she's not there yet," commuter Seth Carp told CNN affiliate KTVU as he prepared to board a Bay Area Rapid Transit train. "I tried to take the Golden Gate Bridge," said a woman who identified herself only as Yemi. "It was a big mistake." She gave up and wound up taking BART. "It was back-to-back bumper, there were rows of cars everywhere," said Christina Chou, who lives in Foster City near the San Mateo Bridge, which served as an alternate route for many. "It was just horrible." Ridership increased on ferries, too, with some people finding a silver lining to the snafu. "I have been looking for an opportunity to go across the bay in the ferry," said Jack Pierce of Oakland. "I'm sorry the cable parted, but I am glad to get the opportunity." Ney said wind gusts of up to 50 mph slowed repair efforts on Tuesday, but the winds had diminished by Wednesday evening. Winds increased vibration by the rods that were fatigued and ultimately failed, he said. "It was a contributing factor, but not necessarily the only factor, and we are analyzing what the factors are right now," he said. Travelers flocked to BART, which ran longer trains and extra trains. The rail line was on track to exceed its peak ridership of 405,000 in a single day, said BART spokesman Linton Johnson. "We have called in extra personnel to help us make sure we operate with every available train car we have in order to provide as much capacity as possible," said BART's assistant general manager of operations, Paul Oversier. Amtrak was running a shuttle between the San Francisco and Martinez stations for Coast Starlight and California Zephyr passengers. The pieces that fell -- a cross beam and tie rods -- came from the same section that was repaired in September over Labor Day weekend, when crews worked almost around the clock to fix a crack in the span. A 50-foot section of the bridge collapsed in 1989 during the Loma Prieta earthquake, killing one person and prompting efforts to make it quake-tolerant. The whole Bay Bridge is slated to be replaced in 2013, said Patrick Siegman, a transportation planner at Nelson Nygaard Consulting Associates, a national transportation planning firm based in San Francisco. The bridge is "really showing its age," he said. "It's kind of a race against time to finish the new bridge before the next quake hits."